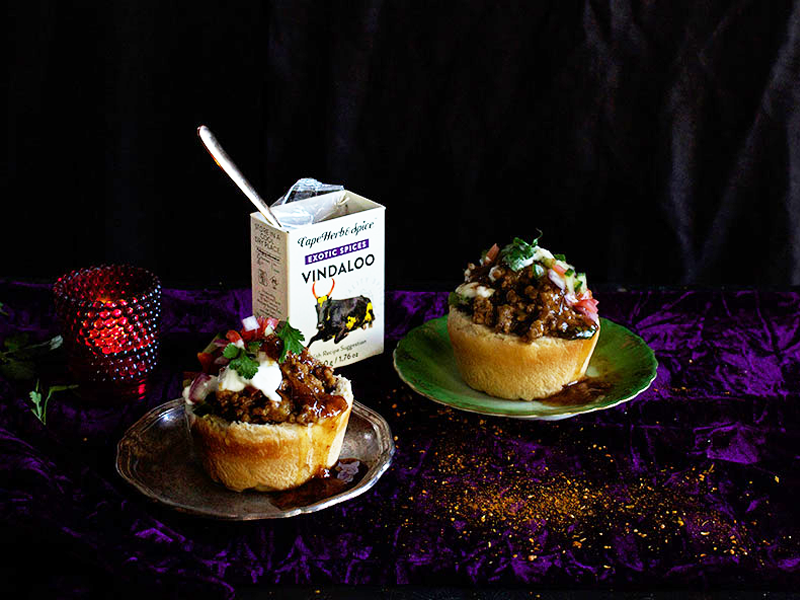 Bunny chow – few living in SA won’t know what this is but, with the world being the globally connected village it is, chances are some folks reading this don’t. Simply put, a bunny chow is curry stuffed into a half loaf of hollowed-out bread. Now given its origins in Durban, a decent bunny chow is in my view always seriously hot. Tastes differ though, and that’s what makes Cape Herb & Spice’s Vindaloo spice an ideal choice for cooking this South African classic. Because in addition to chilli, it’s positively bursting with warming aromatic spices that tickle the taste buds without adding killer heat. There’s nothing not to love about a bunny chow except… all that bread. Even before I became a touch more carb conscious, I would never have considered eating one because half a loaf of bread (a quarter loaf is available for the feint hearted) ­just seems a bit overwhelming, even in its hollowed-out state. You can’t swap a hollowed-out loaf for a hollowed-out bun because it won’t hold once you put the curry in. It needs structure, the structure that the sides of a baked loaf provides. So to the rescue my trusty muffin tin. Store-bought bread dough popped into a muffin tin gives you the same sturdy sides of a loaf, but it’s daintily petite. One of these would serve me well for dinner, but if I’m particularly peckish, two will do nicely. Pre-heat your oven to 180 ºC. Spray a muffin tin with non-stick cooking spray. Form balls of dough large enough to fill each muffin cup half. (If the store-bought dough is too tacky to easily work with, simply dust your hands with some flour.) Cover with a damp tea towel and place in a warm spot to prove for an hour. Bake until browned and cooked through – about 40 minutes. To test, remove one and tap it underneath. If it sounds hollow, it’s done. Set aside and allow to cool. Fry the onion over medium heat in 2 Tbsp oil until it starts to soften but is not browned. Turn up the heat and add the mince. Fry until the mince starts to caramelize a bit and then add the garlic, ginger and Vindaloo spice. Fry for a minute or two. Add the tomato, cider vinegar, curry leaves and water. Turn the heat down real low, cover and cook for 30 minutes. Add the potatoes and cook for another 30 minutes. (If it gets too dry, add a touch more water, but not too much, because you do not want it watery at the end of cooking.) Taste and adjust salt if need be. (Cook’s note: as the Cape Herb & Spice Vindaloo spice already contains some salt, how much of this spice you use will affect how much salt you need to add, hence the addition at the end.) Stir in the coriander. Cut the top off the muffin-tin bread rolls and scoop out the insides. Fill with mince, top with sambal, yoghurt and chutney and serve right away.